Most of the discussion on artificial sweeteners focuses on their presumed safety, of which I have my doubts. The “Generally Recognized As Safe” process is not very assuring, political/financial interests can trump scientific objectivity, some research studies certainly give pause, and there isn’t any data on the effects of consistent artificial sweetener consumption over the span of several decades. Let’s hypothesize, though, that artificial sweeteners are eventually cleared of all wrongdoing. Even then, with undisputed evidence that there isn’t the slightest health risk, I would urge everyone to stay away from them. 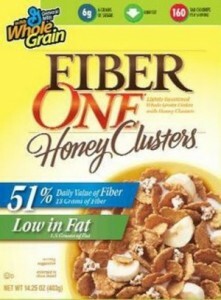 I was wondering what you thought of Fiber One Honey Clusters cereal. The ingredient list is a little long, but the first ingredient is whole grain wheat, then whole grain oats. It tastes so sweet, but the label says there are only 6 grams of sugar per cup. Is this cereal really good for you or not? This cereal also offers — as a result of fortification — a quarter of a day’s worth of the Daily Value of all B vitamins, iron, and zinc; 10 percent of the Daily Value of calcium and phosphorus, and eight percent of the Daily Value of magnesium. Sugar shows up six different times, each time under a different name (sugar, brown sugar, corn syrup, barley malt extract, honey, and malt syrup). This is a common trick used by food manufacturers. If all of these ingredients were labeled as “sugar”, then “sugar” would show up earlier in the ingredient list. Mind you, these six instances do not include the times sugar is part of another ingredient, as is the case with the “wheat bits.” In total, sugar appears in some form thirteen times. The high fiber content is largely due to the presence of inulin. There are a few things that don’t sit well with me. The first is the presence of artificial sweeteners, especially since each serving of Fiber One already delivers a teaspoon and a half of sugar (which I think is a reasonable amount for a cereal to provide). Artificial sweeteners have the “benefit” of being calorie-free (or, in some cases, very low-calorie), but they do nothing in terms of helping our palates get used to lower amounts of sugar in the diet. In fact, they often make it worse. 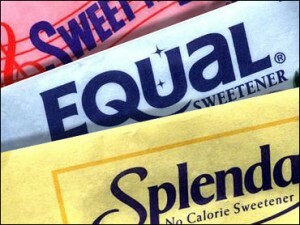 Remember, Splenda is 600 times sweeter than sugar! While there is nothing wrong with including inulin (a prebiotic fiber naturally found in asparagus, onions, bananas, and other fruits and vegetables), I am not a huge fan of extracting it simply to boost fiber values. That said, it is at least being used in a whole grain product. I have a real problem when refined grain products use inulin to give themselves a fiber boost. What I always tell people who consume Fiber One products is to treat it as one of many sources of fiber. In other words, Fiber One should not be the only source of fiber in your diet. I specifically say that because I have come across a fair share of consumers who have told me one reason why they love Fiber One is because, if they have two cups of it a day, then they don’t really have to worry about eating fiber the rest of the day. Not true. Other foods — fruits, vegetables, nuts, seeds, and other whole grains — contain different kinds of fibers (and hundreds of different phytonutrients!) that deliver their unique share of health benefits. Last weekend, Good Morning America did a segment titled “What To Eat When.” For it, they booked Kimberly Snyder, a self-proclaimed nutrition expert who, in this particular instance, spouted off a variety of inaccurate facts and misleading information. Even more disturbingly, several magazines have recently turned to Miss Snyder for nutrition tips. SOS!! Watch the video (linked above) first, and then read my detailed response below. Protein bars are unhealthy because they contain soy protein isolate, a heavily processed ingredient than can impair thyroid function. Yes, soy protein isolate is processed, but the main reason to limit protein bar consumption is because they are high in added sugars, generally low in fiber, and do not offer the same amount of nutrition real foods do. While soy can exacerbate already-existing thyroid problems, it does not cause them. 100% fruit snacks are not the best choice for children because they are too dense. I agree that 100% fruit snacks are not as healthy as they sound (they are basically pure sugar), but what on Earth does her critique of “it’s too much density” mean? The problem isn’t that fruit snacks are calorically dense, it’s that they offer very little nutrition. WRONG. You can find plenty of peanut butter brands that do not add sugar. Additionally, even the ones that do add sugar do not add a lot (two grams, or half a teaspoon, per serving is the average). Almonds are better than peanuts because they have vitamin E and protein. Absolutely misleading. Peanuts have just as much protein and vitamin E. Besides, both almonds and peanuts contain heart-healthy monounsaturated fats and plenty of mineral and phytonutrients. Artificial sweeteners score high on the glycemic index. Besides, if this ‘expert’ is so worried about the glycemic index of foods, why does she then recommend watermelon, which has a very high glycemic index? Oh, no — not that school of thought! No fruit after dinner — it sits in your stomach on top of what you ate and bloats you. Pardon me while I repeatedly smack my head on my desk. This is absolutely false. The human digestive system can handle a piece of fruit at any time of day. Good Morning America producers, you’ve got some ‘splaining to do!